In 2007 one of New Zealand's most traveled yachts, the 21.8mtr classic yacht Windhaven, began a major refit at the Salthouse yard. While infinite attention to detail was lavished on Windhaven during the refit process, unfortunately her owners fell on hard times and Windhaven has been sitting in wait at the yard for the next chapter of her life to begin. 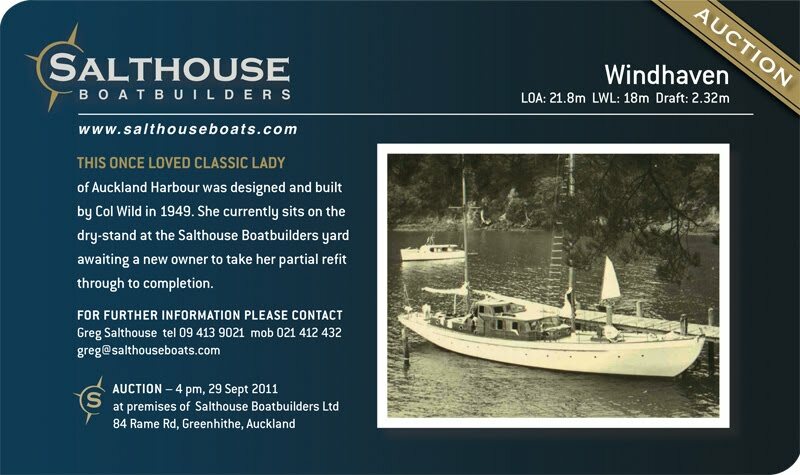 Designed and built by Col Wild in 1947/48, Windhaven was launched at Auckland's Stanley Bay 1949. This classic motor-sailor was built for a well known local businessman, Berridge Spencer, who loved and owned her for about 10 years. After several New Zealand owners, she was taken to the west coast of America where she stayed for approximately 20 years before being brought back to New Zealand. 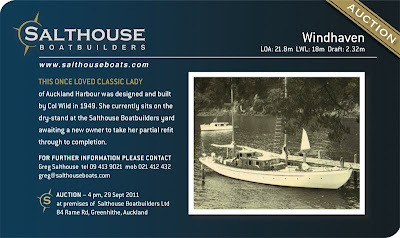 In her time Windhaven was used as a charter vessel sailing the coast of New Zealand and in fact was once used to transport Queeen Elizabeth from her yacht, HMS Britannia, to shore on a visit to New Zealand in the 50's. While the refit work completed to date has been to the exacting standards of Salthouse Boatbuilders, and while the new fibreglass sheathing on the 3 skin kauri hull has saved her from the elements, for Salthouses who live and breathe boats, its nothing but a crying shame to see this classic lady without poise or purpose. It is hoped the auction on the 29th September will result in genuine interest in the vessel and for a new and passionate owner to restore Windhaven to her former glory.